Roberts Stream 67 review | What Hi-Fi? ‘Consistent’ is not how many of us would care to be described. At best it means you’ve made the most of a limited array of talents. At worst, you’re euphemistically being labelled perennially useless. So when we describe Roberts as being consistent, it’s a genuine compliment – and not just a reference to its cabinet full of What Hi-Fi? Awards. Whenever one of the British manufacturer’s radios or speakers arrives in our test room, we feel safe in the knowledge there will be much to praise and relatively little, if anything, to criticise. That is the case with the Stream 67, Roberts’s sterling attempt at a one-box solution to all your streaming, radio and CD listening needs. At £600, it certainly isn’t cheap, but there’s plenty about this ‘Smart Audio’ system to tempt us to part with our cash. We lift the Stream 67 from its box, and it’s clear Roberts’ ability to craft a product with a premium feel to complement a sharp design hasn’t waned. The wood finish feels smooth and solid, the dials on the top are temptingly tactile and the removable front grille is understatedly sleek. The Stream 67 also packs an impressive collection of features and connections. While the front of the unit is reserved for only a CD slot and full-colour screen, the reverse is somewhat busier. It’s here, straddled by the Stream 67’s rear-firing woofers and reflex ports, you’ll find its radio and wi-fi antennae, aux and USB inputs, ethernet connection and headphone output. The Stream 67 can also tether itself to any NAS device or computer also on your home network, and play any stored music in MP3, WMA, AAC, FLAC and ALAC file types. If you don’t actually own any digital music, as is often the case, then as well as Roberts’s full DAB, FM and internet radio offering – with space available for 30 presets – the Stream 67 has Tidal, Spotify Connect, Amazon Prime Music and Deezer built-in, as well as Bluetooth for any service not accommodated for by the unit itself. The Stream 67’s ability to work alongside Alexa and Amazon Echo products, meanwhile, means you can control their playback with your voice. If you’re not interested in conversing with machines, Roberts includes a remote control. This just underlines the company’s ability to make a premium product. Its satisfying weight and ergonomic design are a welcome tonic for the slew of flimsy credit-card style remotes we’ve come to expect from this type of product. It may be less cumbersome altering some of the settings, such as the five-step EQ, via the control app, but we spend most of our time playing with the remote and twiddling those dials, as much for pleasure as anything else. 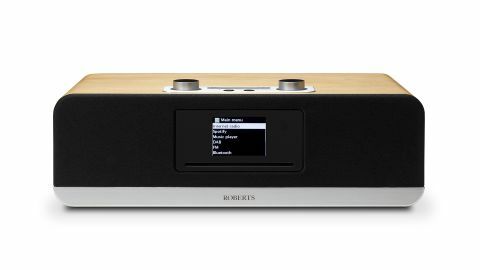 Consistency is key to Roberts’s Award-winning sound just as it is design and build quality, and the Stream 67’s presentation is in keeping with that. We are welcomed with a warm, full-bodied tone. Midrange is an area in which the British manufacturer regularly succeeds, and it’s no different here, with a rich showing that is plumped up by a decent amount of bass weight for a cabinet of this size. Our main issue, though, is that the Stream 67’s pair of forward-facing mid/treble drivers are perhaps a little duller than usual. Experimenting with the EQ, we can achieve a balance that better shows off the top end, but it falls a little way short of sparkling. This isn’t an issue that bugs us overly, but the Stream 67 plays a little too safe for £600 worth of audio kit. That tendency to err on the side of caution is really our only criticism of the this unit, but this temperament also bleeds into Roberts’s handling of dynamics and timing. The performance is competent in every sense, but the slight lack of punch and musical insight means the Stream 67 struggles to wholly entertain. But the Stream 67 doesn’t struggle in general. Timing and organisation are decent enough, and the presentation is certainly not devoid of dynamic range, with a reasonable amount of detail across the inputs. We’d just like to be more engaged, and the Stream 67 to be less of a background listen. However, few options at this price offer such a varied buffet of listening options all in one box – and Roberts does it better most of those. Those in the market for this kind of audio solution will be pleased by the sound Roberts offers here. But for the full five stars, though, we’d want a little more excitement in our lives.